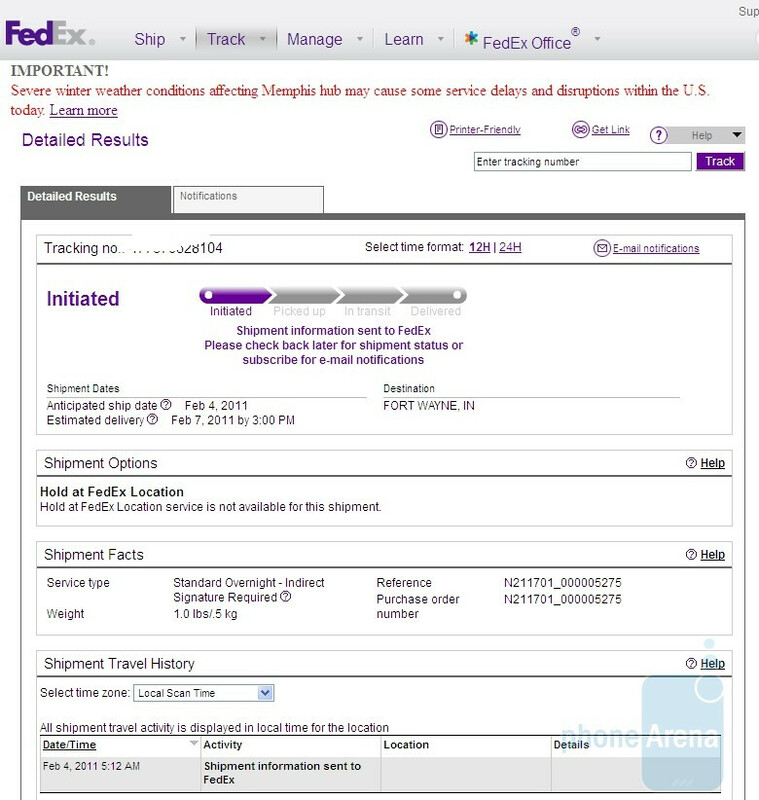 A reader just sent us their FedEx delivery tracking screen, which they claim is issued for a Verizon iPhone just ordered 5:12am this morning. 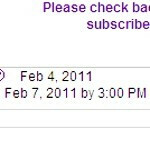 FedEx says it will be at their doorstep by 3pm on Monday, February 7th. And that's with the pre-orders sold out and "record" number of phones sold, as per Big Red. When you are lucky, you are lucky, even with snow blizzards pounding the Midwest in the last few days. A soul will be connected with their Verizon iPhone on time - miracles happen all year round. We'd be curious to check if the phone actually gets there on Monday, just for kicks. Same here. My FedEx tracking info says mine will be delivered Monday as well. Woot! Where can i find my tracking number for Fed ex? I really want to track it but i dont know where it is. I tried all the codes given to me in the Confirmation Email. Mine was about 30 miles away from my house. Supposedly it's on the truck in transit to the facility closest to me. If I'm lucky I may even get it today! Come on FedEx! I got a UPS tracking number today. but the UPS screen does not say when it will be delivered- just that it is "in transit" and currently in West Chester PA, about 15miles away from my home in Philadelphia. Is Verizon splitting up deliveries between UPS and FedEx? I got a UPS Tracking number as well, and I'm in MD. Mine also says the same thing with no estimated delivery date. I wold think that they are because of the number of orders that need to be delivered. lol how the hell did they manage to order an iPhone, today at 5:12 am, when it has been sold out since yesterday? Hax? I ordered it at about 3:05am on the 3rd, Verizon just sent the shipping info notice to my email at 4:12am this morning and now FedEx received the info from Verizon at 5:12am this morning. Guess I didn't make it clear when I sent the info in to phonearena. haha that makes more sense. Looks like we're all going to enjoy our new phones on Monday, earlier than expected. Meh, all I see are too many fanboys taking up bandwith on the Verizon network. Go to At & t and use their crappy network! We are all getting our phones on the 7th kids, and yes Verizon is using both UPS and FedEX for their deliveries. Ditto 3P by the 7th. Big deal !!! For the last 6 months how many dropped calls have you had? Oh and how fast can you download/upload? Oh, do you have unlimited data ? Also VZW was SMART to wait for the iphone so they can PREPARE... Unlike AT&T their world couldn't be delivered using the Iphone. So shut up and eat your cereal ! Confirmed UPS Next Day Air Saver. Left Memphis 6:10AM has arrived in Louisville, KY awaiting confirmation when it departs Lousiville. This means in 'some' major metro areas that some could see delivery on SATURDAY (best case scenario) and spot on schedule for MONDAY (worst case scenario). Got my tracking number, but no date of delivery either. But one of the people I work with got his today at 12:30. He came in showing it off. I want to smack him for gloating lol/ and @ APK... thats why your on the internet... cause you can't make calls. I think that if they are delivered early, they probably won't be able to be activated until the 10th. Same thing here but via UPS. Their web site doesn't specify delivery date yet because Verizon submitted it too late last night. But calling on the phone the rep confirmed that it would be delivered Monday as well. Probably the same for anyone else with UPS tracking numbers and no delivery estimates. 4 months of dropped calls and slow internet access you say? How's that 2GB limit treating ya? Probably can't reach 2GB anyway when the data comes in that slow. Same here I got that email scheduled for Monday. Hope to see that white truck pull up!!! Mine is set for delivery on the 7th but Because of my job I can get into the UPS buildings. I may have to go hunt this thing down tonight. I'm hoping this phone cures my Omnia II depression (worst smartphone IMHO). For those tracking their order: I found out via Verizon automated voice-response ("tracking delivery date") that my phone was sent UPS 2nd Day Air not overnight but no delivery date provided. I ordered mine at 3:01am on the 3rd, got VZ shipping confirmation late that night with UPS posting only 'Origin Scan 8:20PM Feb 3 West Chester, PA', - but no estimated delivery date. Tracking was updated an hour ago to 'Departure Scan 11:30 A.M.' this morning. My guess is Monday but it would be doubly nice to see that brown truck manana! Just tracked my order from ups.com/says it will be delivered on 02/07 (monday) by 10:30am Central time! Verizon is finally getting the iPhone 4!!!! Yea...too bad AT&T will be getting the iPhone 5 in 5 months...lol. And Verizon's iPhone will only be a 3G device, while the rest of the world is on 4G. So yea I'm very happy with my Epic 4G =D I heard Verizon has to hire security guards for their employees at the stores because of the iphone. How pathetic people are over a freaking phone. FYI ... The Iphone 5 is coming out but BOTH carriers could get it ?? Also Sprint isn't the only carrier with 4G, they may have been the first using that crappy WiMaxx but I digress. Stay happy with your EPIC 4G because VZW is coming out with a WAY better 4G phone that will but that Epic to Shame ... Happy Surfing !! !